After you click each refined characteristic, the page will automatically reload with those specific pets. It’s important to keep in mind that clicking “Special Needs” will return results with any animal in your area with special needs. That could include kitties with FIV, who are blind, have special household needs and more. 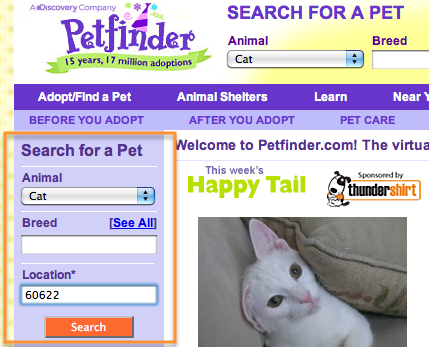 However, this refined search does make finding a CH kitty a bit easier! If that seems like a bit too much work, check out the Adoptable CH Cats List on this site. It’s an aggregated list that I try to update monthly. What’s great about this list is that you can search by availability, gender, location and more. I hope to soon add age category, too. If you’d like to have a CH cat listed on the Adoptables page, please read this. The Cerebellar Hypoplasia Cats and Kittens Group is another great place to hear about CH cats that are up for adoption, as the moderators post them as soon as they hear about them. This is also a great place to find out about kitties that are in immediate need of adoption or foster. If you join this group, you can usually find a more up-to-date list of adoptable CH cats here as well. Do you know of other great places to find CH kitties that are up for adoption? Please share! Hi! I would love to adopt kitties with CH, but I am in Europe. Have you a way to find cats with CH in the UK or mainland Europe? Yes! Every so often I hear of cats available in Europe/the UK. I would recommend joining Facebook if you haven’t already and joining the Cerebellar Hypoplasia Cats UK group. Often people will post there if they have a CH cat up for adoption. Good luck! In the UK you can find CH cats at Cats Protection shelters. Normally Cats Protection staff are well informed about CH and can offer help and advice. Both my CH cats came from Cats Protection – one was in a shelter and I was asked if I would home him, and the other was staying in a vets as there was no room in the shelter. They like to do a home visit before adoption but you could certainly ask if you could adopt without a visit. CH Kittens for Adoption Harriman, NYAlfie and Benjy have the most severe symptoms in the litter. Cory seems symptom free and Danny and Eddie are small for their age, but up on all fours and very active. They have been to the vet and were well checked and tested neg. for FIV/FeLV. All are sweet and loving. They were born at my foster home on May 1st, 2013. I work with a local rescue that is closing and we have a very sweet CH cat named Oriah. She is about 5 yrs old, well-behaved (no housetraining issues), loves other animals, and friendly. She also has digestive issues that require a special diet; she cannot eat other pets’ food. If anyone is looking for a CH cat, we are near Madison, WI and the number to call is (608) 212-5430. Or look for her on Petfinder.com under Kindred Spirits Animal Network. I would to adopt a CH cat but I live in Ottawa, Ontario this little sounds so precious !!! I have a CH cat that I need to re-home. I am trying to find a great, loving home & family to give her a great life. She is a great kitty but unfortunately I need to re-home her. She is a gray tabby. Petit (less than 10lbs). She can stand, walk, and run (very fast). She is wobbly but can get along just fine. She loves to play with toys and other animals. She loves being outside in the backyard and running in the grass. She likes to play, hide, and lay under bushes and plants like a jungle kitty. She goes potty on training pads that I lay inside a litter box. I currently have a kitten with cerebellar hypoplasia she gets along great with other kittens and we are looking to get her a friend! I can’t seem to find any around us. I would love to adopt another. have tou found a kitty playmate? I am also looking for a friend for my cat with CH. I have been looking for about a year now with little luck, I am located in North Alabama if anyone can help. Hi! Any places in Ny or Nj to adopt a kitty with CH? Hi, I have a 5 yr old cst who was always gentle ever since we moved to our new home and after visiting his vet for yearly shots which he hates and gets very anxious. Last visit to the vet changed him completely. He is aggressive and when gets spooked by thunders or noises he attacks. He recently attacked a neighbour who peted him. How can such a loving cat also be aggresive for no reason. At this point we might have to put him to sleep. We are devastated. Any suggestions are welcomed during this crucial time. Hi! I have 3 male kittens with cerebral hypoplasia and would like to find them a forever home. Located near Harrisonburg VA. Kittens are about 8 months old. I would like to give them away to somebody who already has cats so they can have a friend. Please email me at kelseymeck@gmail.com – located in Charlottesville.